At the forex market we are now seeing a slight recovery before Friday's news. Currency traders are nervous and prepare to meet the strong trending moves. Currency pair Australian Dollar and Japanese Yen is clearly shows increasing trend on the chart. And it's not that the Australian dollar started shaking, but that the Yen beginning to yield its position in the forex market against all currencies. Australian Dollar is weakening at all crosses and continues to fall down, but Yen was even weaker. 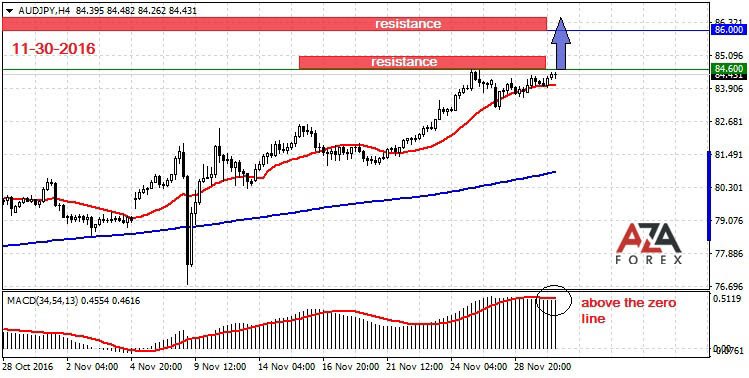 We set aside an order to break through the resistance level of 86.40 with a target of 140 points to the next resistance level of 86.00. Just after the 86.00 there is a resistance area where the price can get the punch to the teeth. It is possible that the price continue the upward rush, but given the weakness of the Australians, this scenario is unlikely to happen.